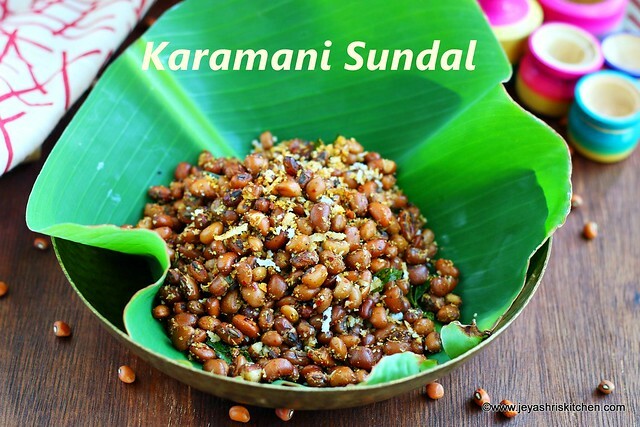 Karamani Sundal recipe, with video and step by step pictures. 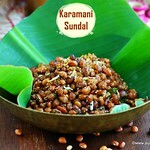 Karamani Sundal made using freshly ground spices, enhances the taste and flavour of the sundal, an easy Navaratri recipe. Navaratri 2018 is starting today. We make variety of Sundals for the Navaratri season and Jeyashri's Kitchen has a huge collection of Navaratri Sweets and Sundal recipes. 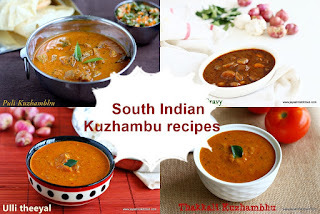 This year also i planned to post few sundal and sweet recipes and got the Red eyed karamani to make sundal. 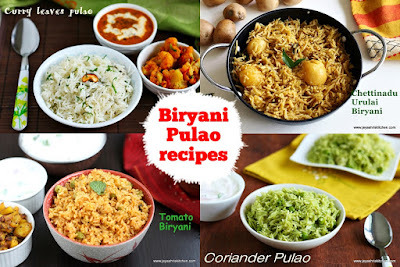 I actually planned to make a simple basic sundal but some time back, one of my friend shared a Karamadhu podi recipe(the Iyengar style curry powder) with me and also shared his mom's recipe of the same. Though i got the recipe some time back, i didn't try it out. Suddenly after soaking the karamani sundal the idea of using the karamadhu podi in the sundal. We both discussed few other options of using the powder too. (see notes section) I am not a great fan of karamani, as even during my childhood days, whenever karamani sundal is made during navaratri, i will get so upset. I never like karamani, but the red one was still ok compared to the lobia beans. This podi was too flavourful and it took the lame karamani to a different level. 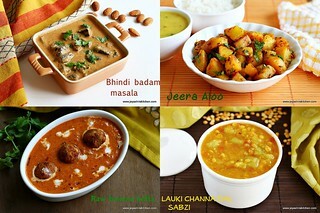 Try this out with any variety of sundal and i am sure you will enjoy it as how we did. 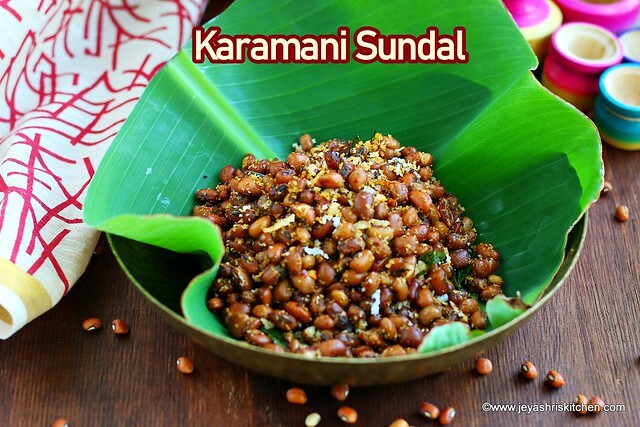 Description: Karamani Sundal made using freshly ground spices, enhances the taste and flavour of the sundal, an easy Navaratri recipe. Soak the Karamani in water for 6 hours or overnight. Add little salt to this and pressure cook this for 3 whistles. Do not overcook this. It should be cooked and at the same time firm too. Now let's make the spice mix. 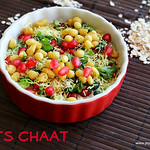 In a pan add 1 tsp of oil and add the coriander seeds, channa dal, urad dal, methi seeds, pepper and red chili. Add asafoetida and switch off the flame. Allow this to cool completely and grind this into a slightly coarse powder. You can store this powder and keep inside the refrigerator. 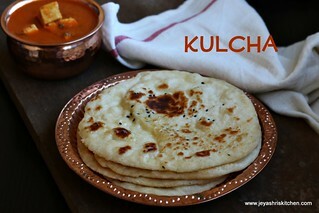 This can be used for potato curry, vazhakkai curry and any variety of sundal. 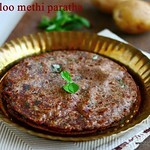 I used this for rasam and pitlai too. 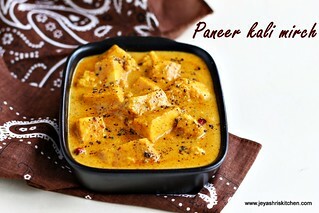 In a pan add coconut oil and add the mustard seeds and curry leaves. Once splutters add in the cooked karamani. Add 2 tblsp of spice powder to this. This quantity for perfect for 1/2 cup of the karamani i used. If you want more, add 1 tsp more. Let this cook for a minute. Switch off the flame and add the coconut. Karamani sundal is ready for neivedyam. Adding salt while cooking the karamani, avoids the karamani from getting too mushy and also we get the salt infused into the sundal. Once the spices are roasted well, immediately take it out from the pan. This will avoid them getting burnt. 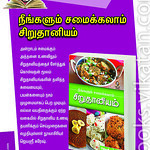 This spice powder can be used for potato curry, raw banana curry, brinjal curry and kovakkai curry as well. 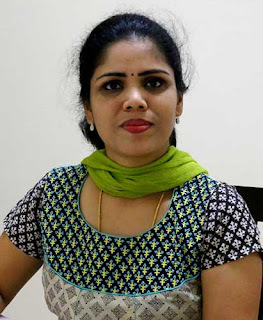 Karamani can be replaced with any other variety of Sundal.